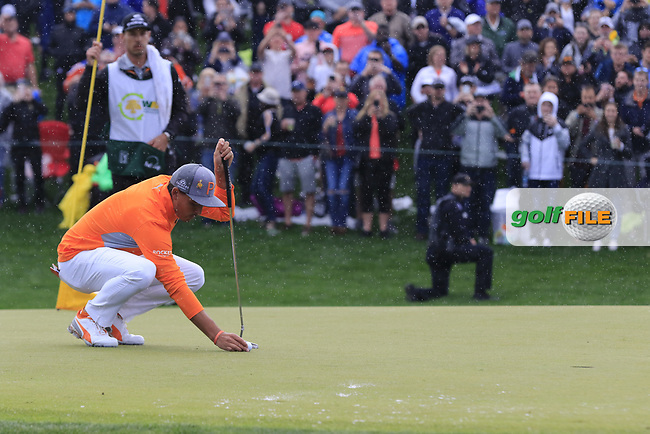 Rickie Fowler (USA) lines up the putt for the win on 18th during the final round of the Waste Management Phoenix Open, TPC Scottsdale, Scottsdale, Arisona, USA. 03/02/2019. See the latest images from the European Tour, PGA Tour, Asian Tour, LPGA & LET and Amateur tournaments. Photo website with Rights Managed photos, images, illustrations and footage available for download immediately for commercial and editorial uses. Golffile is a leading independent supplier and producer of stock golf pictures and visual content. Search and find high quality images for design, print, web-use and publishing. Buy photos from our extensive collection of model released and property released golf images. Search some of the most beautiful travel and landscape golf pictures from our own photographers and license from our large collection of content, modern and archive, focusing on golf. We provide free research. Register for personal account management and for full use of our Live & Stock Photography website and start to download images now.